I haven't read all the Colin Cotterill novels starring Dr. Siri Paiboun, the only coroner in Laos in the 1970s, but the atmosphere of the books is remarkably consistent throughout the series. That means, for better or worse, that if a reader (myself, for instance) doesn't really engage with one of the books, the same is likely to be true for the rest. And this post is less a review than a meditation on that engagement or lack of it on my part. Cotterill doesn't pretend to be writing crime fiction. The novels have almost as much in common with science fiction as with the mystery genre (with the spirit world substituting for the strangenesses of alien worlds). If you aren't familiar with the series, various spirits share Dr. Siri's body with the doctor himself. And the twists and turns of the plot often (as is the case with Slash and Burn, reoortely the last in the series) have more to do with demonic possession or other intrusions into the wideawake world as with anything happening solely in that quotidian realm. The stories also have accumulated a cadre of regular characters, each eccentric in his or her own way, as the series has progressed. Among them there is a constant stream of banter that in some ways is really what the books are about, as well as being a source of the considerable comedy. So perhaps my lack of enthusiasm for Dr. Siri says more about me than about the series. I started this blog as a way of exploring my own tendency toward one kind of crime writing rather than another, and the kind that I was and still am finding myself gravitating toward is a grittier and more realistic style, reflected in the color reference in this blog's title. Not that I don't enjoy comedy in noir, I do. Some engagement with the workaday world, though, seems to be a requirement for me. 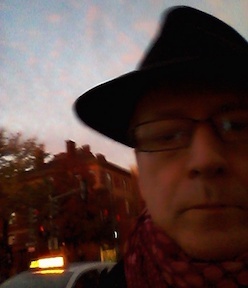 Dr. Siri's advantures include a lot of actual politics and history (in Slash and Burn, Air America and the Vietnam War as well as American politics) but the stories bear the same sort of relation to those realities as, say, The Russians are Coming, the Russians are Coming bore to the Cold War. In other words, a comic or satirical relationship, and a relatively broad and good-natured comedy. 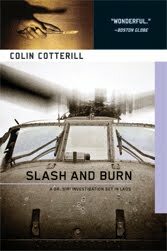 In Slash and Burn, Siri is offered an opportunity to put together a team that will investigate the case of an American helicopter pilot missing in action during the Vietnam War, on a sortie in Laos, along with a U.S. delegation that includes military, political, and civilian participants. Translation is a constant issue, as well as differing (and cloudy) motivations for the current search as well as the helicopter's original mission. The spirit world is a it less prominent than in some other Siri adventures, but does play a key role at several points; but the resolution of the story's mysteries has ultimately to do with this world's obsessions, ones that are as old as history. I haven't read the first of Cotterill's new series yet: perhaps someone could comment on whether it is similar in tone to the Dr. Siri series or would recommend it to noir-obsessed readers such as myself. 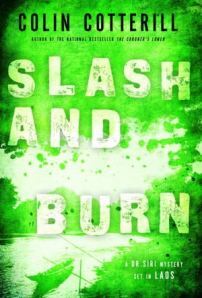 But in any case, Slash and Burn brings to a close a unique body of work that crosses and stretches a lot of the boundaries of genre fiction. I loved the Dr. Siri books, probably for all the reasons it didn't appeal to you. The crimes weren't what held me, it was Siri's take on politics, war and fumbling toward being a decent human being. If you haven't read Anarchy and Old Dogs, I would recommend that you try. It was less playful than the others and more complicated; I felt as though I were reading a good spy novel. YMMV. As for the new series, I've read the first and also enjoyed it. I think you'll find it similar to Dr. Siri, but with some unexpected characters. Definitely not noir, but still worthwhile.